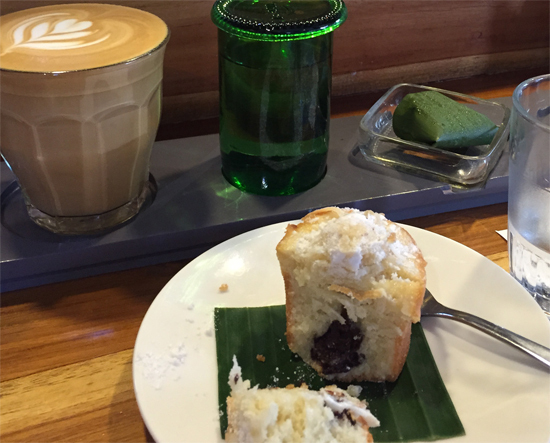 If you love coffee, a stop at Seniman during an Ubud stay is essential. All beans are graded and roasted in-house and all espressos are actually double ristrettos, so you know you’re getting the very best, smoothest brew around. But the vibe here is also chilled out, so you may well want to hang out for a while here to use the speedy WiFi, even if you’re jumping out of your skin after a coffee or two. 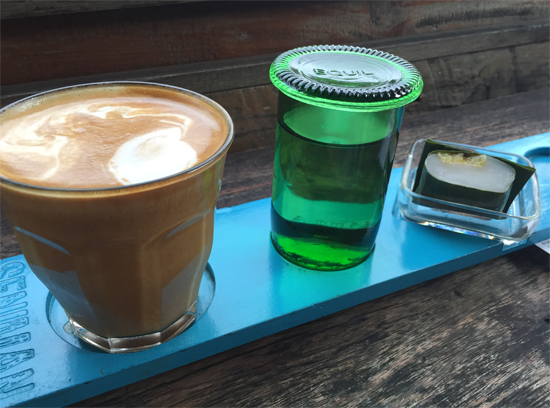 Order just a coffee and it will come on a wooden platter with a glass of water served in an upcycled glass as well as a banana leaf-wrapped coconut sweet on the side. 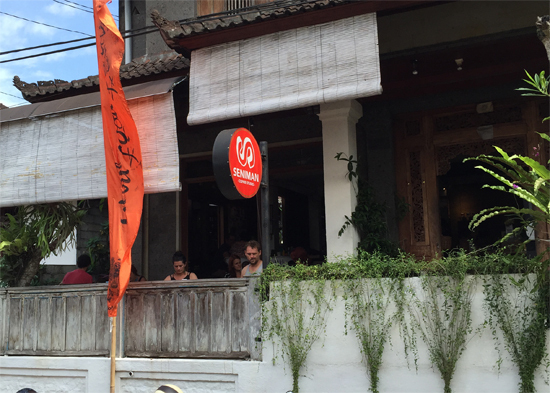 But teas, chocolate drinks and juices are also on offer — expect to pay 25,000 rupiah and up for most. If you’re feeling more peckish, their baked goods are very well done — we tend to have one of their friands (28,000 rupiah). We haven’t tried the meals here, but they offer both Indonesian and Western-ish dishes — sate, soto ayam, gado gado. Worse ways to start a day. If you haven’t tried cold brew yet, or you have and are addicted like us, pop on over to their joint across the road, which specialises in that magical elixir (open 13:00-21:00 daily). 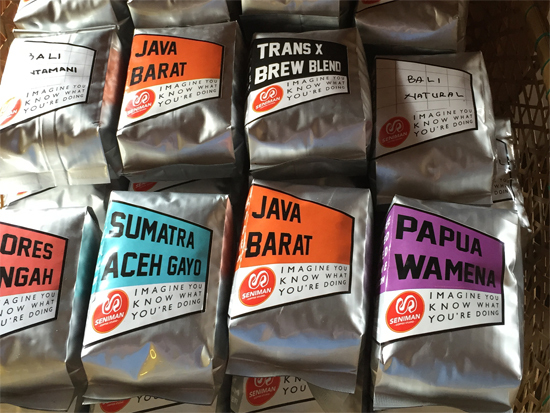 All beans used are single-origin and sourced from Indonesia as well as South and Central America and Africa. Snag a bag of the local stuff (Aceh, Java, Flores, Papua, Bali — it’s practically a tour of the archipelago…) on your way out to take home as a souvenir. 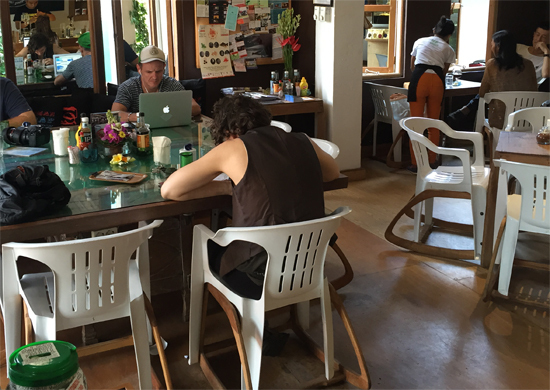 And take a peek into their little shop where you’ll find their upcycled glasses (from 30,000 rupiah) as well as a range of other coffee related paraphernalia — even the right chair to sip a brew on, the “Bar Roker” (1.4m rupiah). If you’re a real convert, they offer barista classes in roasting, cupping, tasting, manual brewing and so on for 250,000 rupiah for 1.5 hours — could be a good surprise gift for someone you’re travelling with.